Good morning, dear friends! What a great way to start the week! An awesome recipe and an amazing giveaway! I am thrilled! 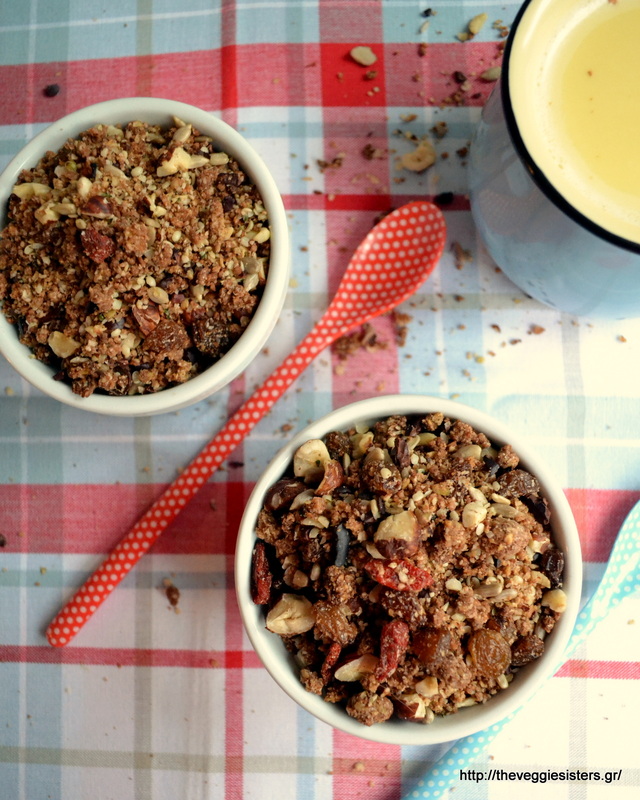 First of all today we are making a homemade granola that is packed with super foods. It is absolutely mourhwatering and will give you a good reason to get out of bed every morning! Furthermore today begins a great giveaway in collaboration with my favourite e-shop Biosophy! It is a great e-shop with a vast variety of high quality products ideal for vegans/vegetarians or healthy foodies. A lucky guy/lady will win a gift card worth 60 euro! He/she can pick the products he wants or Biosophy will make the choice for him/her. To enter the giveaway you have to like The Veggie Sisters and Biosophy facebook page, share the post and leave a comment on this post here or on facebook and instagram. The giveaway expires on Monday the 20th of February at midnight and will be announced on the post of 23th of February. Good luck everyone! Happy new week! Oh, I just remembered that it’s Valentine’s Day tomorrow! I hope you enjoy it whether you have a companion or not. You can be in love with your dog, hobby, a place. It doesnt have to be a person, right? Life is beautiful and we have to be balanced and happy even when we are alone. I have been there and I know how it feels. You have to make the most of what life gives you! So enjoy it in its fullness! Kisses and hugs! In a bowl combine buckwheat with cacao powder, hazelnuts and salt. In another bowl combine agave syrup with hazelnut butter and oil. Mix the wet and dry ingredients. Put granola on a baking tray lined with parchment paper and bake in preheated oven at 170C for about 20 minutes or until golden brown. Stir in the meantime and watch out so that your granola doesnt get burnt! When ready, remove from the oven and allow to cool. 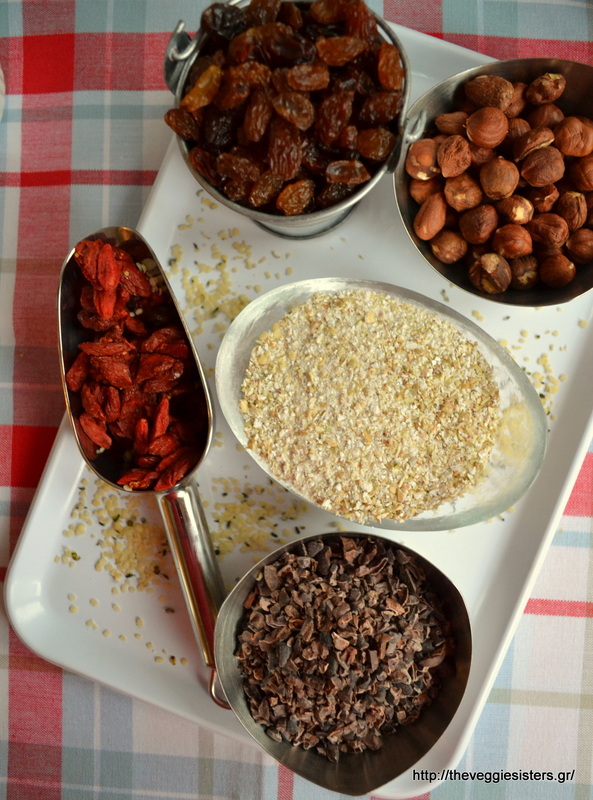 Then add raisins, cacao nibs, sunflower seeds, goji berries and hemp nuts. Stir to combine. Store in an airtight container! Enjoy! 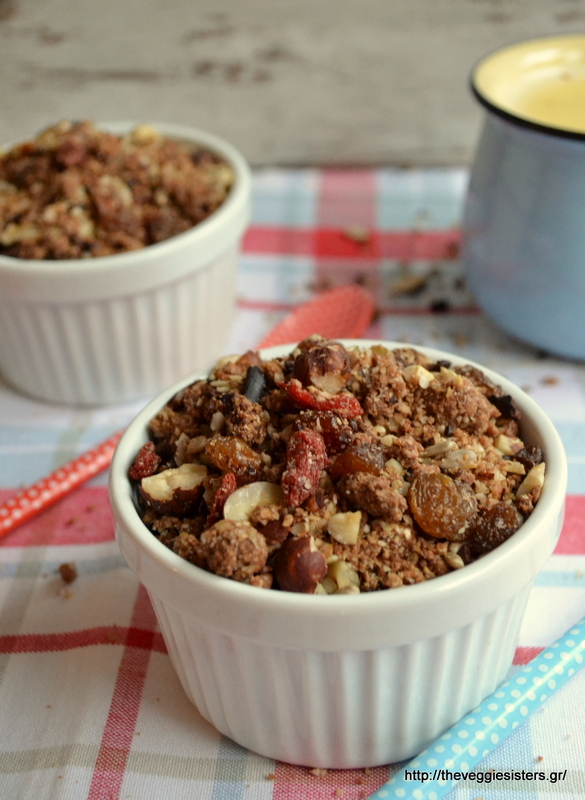 Share the post "Super foods granola and giveaway!" Next PostΓκρανόλα με υπερτροφές κ giveaway! Πολύ ωραία συνταγή, και με αγνά υλικά!